Many of the constituents whose lives were just sacrificed for a tax cut are ready to greet their representatives. Shortly after House Republicans passed the cruel American Health Care Act, they left DC for a recess. Back in their districts, many of the constituents whose lives they just sacrificed for a tax cut are ready to greet them. MoveOn, Indivisible, the Women’s March, and the Town Hall Project have joined forces to launch the Payback Project to support local groups who are targeting their representatives and holding them accountable for their vote on the AHCA. 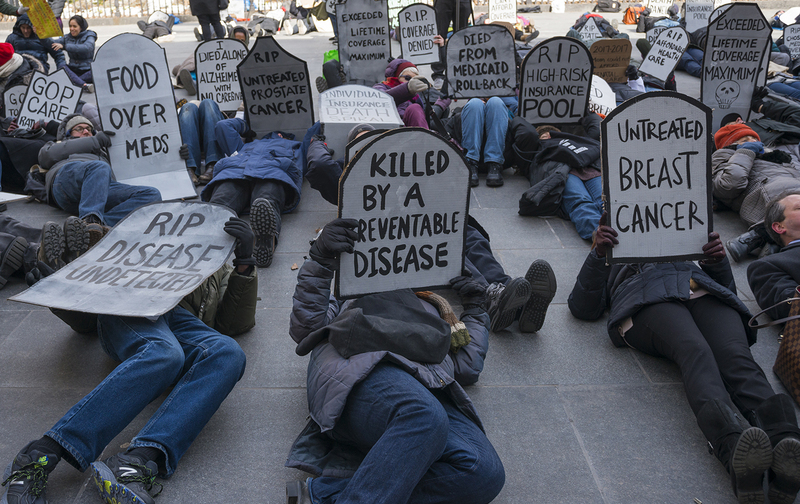 Beginning with the “Payback Recess,” many of the initial “payback” events are taking the form of die-ins intended to illustrate the deadly effects of a bill that cuts $800 billion from Medicaid and makes insurance unaffordable for many people with preexisting conditions. The Payback Project lists town-hall meetings and office hours being held by your representative, as well as the die-ins and protests being organized in your community. For instance, die-ins are being organized at representatives’ offices across the state of Arizona and activists in California have organized a “Town Hall With or Without Mimi Walters,” just one of the many events across the country targeted at lawmakers who refuse to face their constituents. For those representatives who do hold town halls, the Payback Project has some suggested questions. The Payback Project provides a step-by-step die-in planning guide for people whose members of Congress voted for the AHCA. The goal is to make voting for the AHCA “absolutely politically toxic” for members of Congress. The planning guide includes tips for grabbing the attention of the media and a list of key tasks for organizers. You can find the die-in planning guide here. On Twitter, the hashtag #IAmAPreexistingCondition has already sparked powerful stories of people struggling with illnesses or disabilities that could render them essentially uninsurable under the AHCA. The Payback Project is collecting more stories on the Accountability Wall on its website. You can submit your story there or by tagging #PayBackProject on Facebook or Twitter. When you can’t be there in person, tie up your representative’s phone lines (and while you’re at it, call the senate to demand it reject this heinous bill). You can find your representative’s website, which should list their district phone number, here. Finally, we’d like to know how many readers decide to participate in the Payback Recess or find other ways to protest. Fill out the form below to let us know what you’re up to. You can also use this form to stay updated on more actions through The Nation’s Take Action program. What do you plan on doing to hold your members of Congress accountable?